Yellowstone National Park, and is home to one of the most recognizable and majestic mountain ranges in North America. 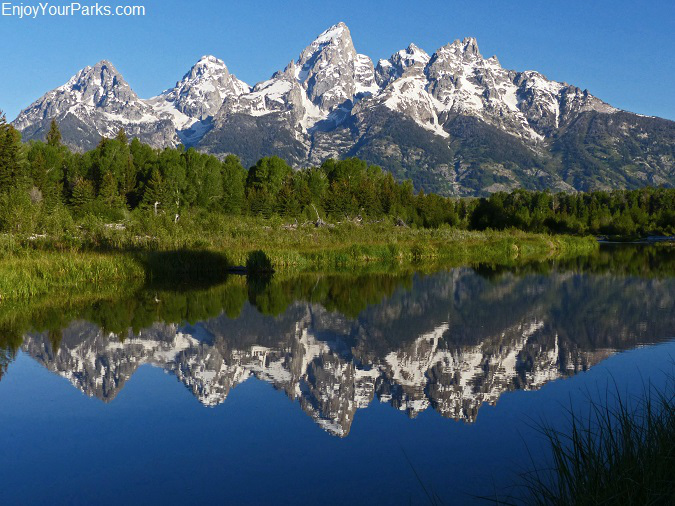 At 310,000 acres in size, the towering Teton Mountain Range runs north and south through the entire park, and is the main attraction of this amazing park. 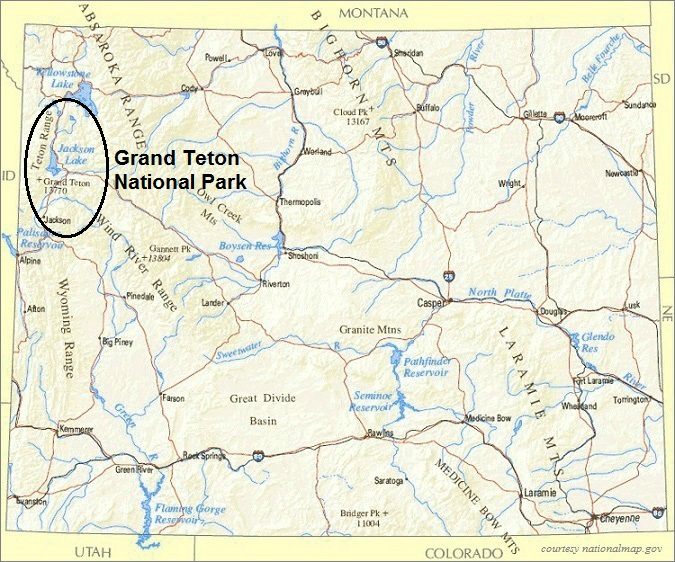 Grand Teton National Park is named after Grand Teton, the tallest mountain in the park at 13,770 feet above sea level. And what is so remarkable about Grand Teton as well as the entire Grand Teton Mountain Range is the fact that there are no foothills to the east. 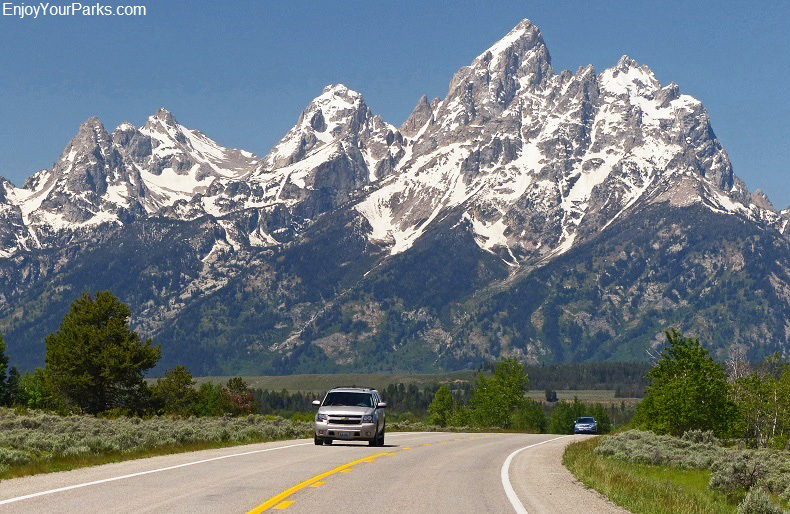 So as you drive along the roadways such as the Teton Park Road and U.S. Highway 89 which are both roads located just east of the range, the peaks literally shoot nearly straight up nearly 7,000 vertical feet from the eastern prairie into the sky.... which creates a dramatic landscape that visitors will never forget. There are over 200 miles of fantastic hiking trails throughout Grand Teton National Park, as well as over 1,000 drive-in campsites in several conveniently located campgrounds throughout the park. In addition, there are several lodges, restaurants and visitor centers that help make your stay in Grand Teton Park more enjoyable. Oxbow Bend with Mount Moran, Grand Teton National Park. There are also many lakes scattered throughout Grand Teton National Park, including the 15 mile long Jackson Lake, as well as the fabled Snake River which winds its way through practically the entire length of the park, providing excellent scenic float and blue ribbon fly fishing opportunities. And because much of the rock that makes up the tallest peaks in Grand Teton National Park, such as Grand Teton, South Teton, Middle Teton, Mount Owen, Teewinot and Mount Moran, are composed of solid granite, technical mountain climbing is extremely popular here. Grand Teton National Park is a nearly pristine ecosystem. There are over 1,000 species of plants, 300+ species of birds, over 12+ species of fish, and 40+ species of mammals. 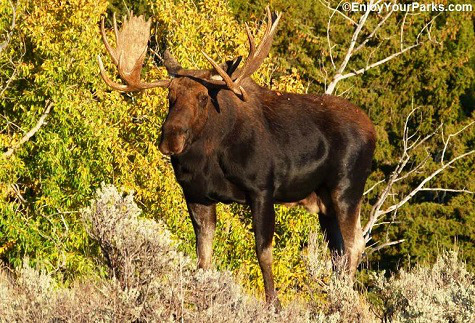 And due to the terrain and where the roadways were designed, Grand Teton National Park is one of the top wildlife watching national parks in the nation. 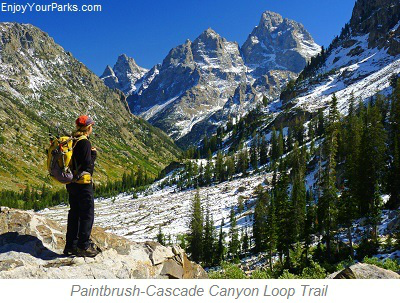 In our Grand Teton National Park section of our website, we not only thoroughly cover what we feel are the "Top Ten Things To Do In Grand Teton National Park", but we also feature all of the top hiking trails in this incredible park. So not only will you know exactly where to go and what to do in Grand Teton National Park, if you love hiking, we'll show you all the great hiking trails as well. 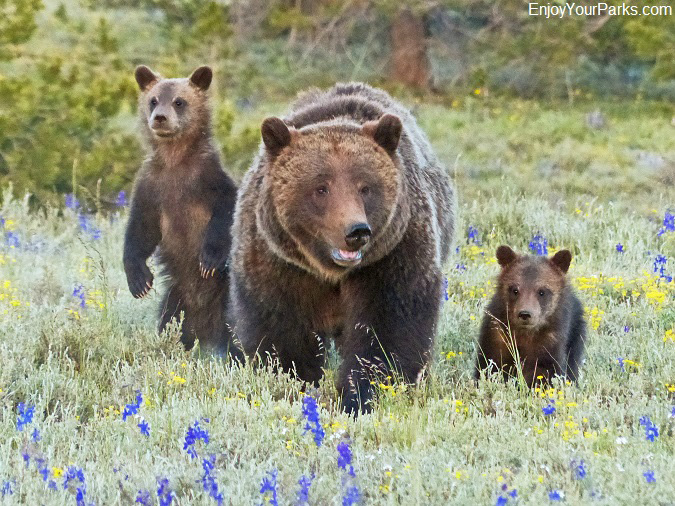 Grizzly bear sow and cubs, Grand Teton National Park. 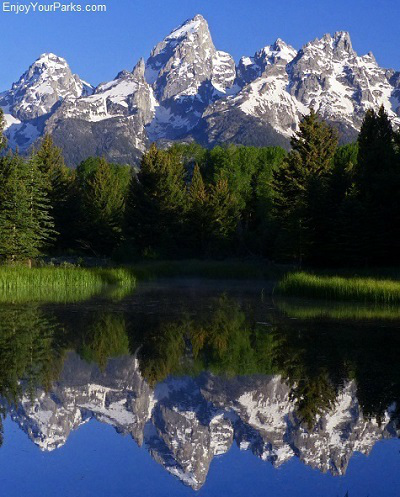 It goes without saying that Grand Teton National Park is one of Wyoming's very top attractions, and because we have spent so much time exploring and discovering this special place throughout our entire lives, we have built an entire section of our vacation website devoted to Grand Teton National Park. Click Here to visit this very detailed and helpful section. 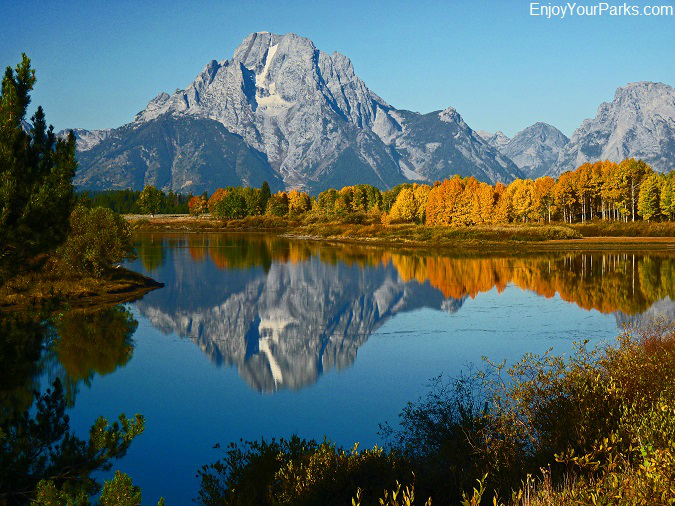 Our goal was to show you exactly "where to go, what to do, and where to see animals", and to simplify all this information to help make things easier as you plan your Grand Teton National Park vacation. We feel we accomplished this lofty goal.